Tammany Hall, or simply Tammany, was the name given to a powerful political machine that essentially ran New York City throughout much of the 19th century. 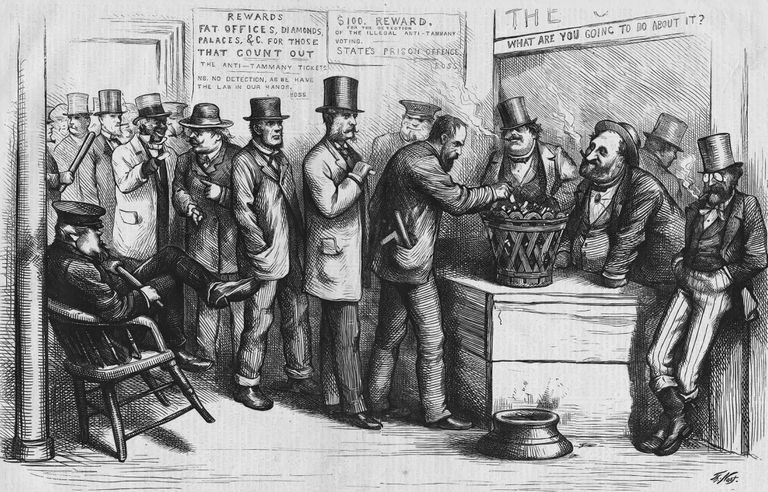 The organization reached a peak of notoriety in the decade following the Civil War, when it harbored "The Ring," the corrupted political organization of Boss Tweed. After the scandals of the Tweed years, Tammany continued to dominate New York City politics and spawned such characters as Richard Croker, who may have killed a political opponent in his youth, and George Washington Plunkitt, who defended what he termed "honest graft." The organization existed well into the 20th century, when it was finally killed off after decades of crusaders and reformers sought to extinguish its power. Tammany Hall began modestly as a patriotic and social club established in New York in the years following the American Revolution when such organizations were commonplace in American cities. The Society of St. Tammany, which was also called the Columbian Order, was founded in May 1789 (some sources say 1786). The organization took its name from Tamamend, a legendary Indian chief in the American northeast who was said to have had friendly dealings with William Penn in the 1680s. Before long the Society of St. Tammany turned into a distinct political organization affiliated with Aaron Burr, a powerful force in New York politics at the time. In the early 1800s, Tammany often sparred with New York’s governor DeWitt Clinton, and there were cases of early political corruption that came to light. In the 1820s, the leaders of Tammany threw their support behind Andrew Jackson’s quest for the presidency. Tammany leaders met with Jackson before his election in 1828, promised their support, and when Jackson was elected they were rewarded, in what became known as the spoils system, with federal jobs in New York City. With Tammany associated with the Jacksonians and the Democratic Party, the organization was viewed as friendly to the working people. And when waves of immigrants, especially from Ireland, arrived in New York City, Tammany became associated with the immigrant vote. In the 1850s, Tammany was becoming a powerhouse of Irish politics in New York City. And in the time before social welfare programs, Tammany politicians generally provided the only help the poor could get. There are many stories about neighborhood leaders from the Tammany organization making sure that poor families were given coal or food during hard winters. The New York poor, many of whom were new arrivals to America, became intensely loyal to Tammany. In the period before the Civil War, the New York saloons were generally the center of local politics, and election contests could literally turn into street brawls. Neighborhood toughs would be employed to make sure the vote “went Tammany's way.” There are myriad stories about Tammany workers stuffing ballot boxes and engaging in flagrant election fraud. Corruption in the administration of the city also became a running theme of the Tammany organization in the 1850s. In the early 1860s, the Grand Sachem, Isaac Fowler, who held a modest government job as a postmaster, was living lavishly in a Manhattan hotel. Fowler, it was estimated, was spending at least ten times his income. He was charged with embezzlement, and when a marshal came to arrest him he was allowed to escape. He fled to Mexico but returned to the US when charges were dropped. Despite this constant atmosphere of scandal, the Tammany organization grew stronger during the Civil War. In 1867, a lavish new headquarters was opened on 14th Street in New York City, which became the literal Tammany Hall. This new “wigwam” contained a large auditorium which was the site of the Democratic National Convention in 1868. By far the most notorious figure to be associated with Tammany Hall was William Marcy Tweed, whose political power made him known as “Boss” Tweed. Born on Cherry Street on the Lower East Side of Manhattan in 1823, Tweed learned his father’s trade as a chairmaker. As a boy, Tweed was a volunteer with a local fire company, at a time when private fire companies were important neighborhood organizations. Tweed, as a young man, gave up the chair business and devoted all his time to politics, working his way up in the Tammany organization. Tweed eventually became the Grand Sachem of Tammany and wielded immense influence over the administration of New York City. In the early 1870s, Tweed and his “ring” demanded payoffs from contractors who did business with the city, and it was estimated that Tweed personally amassed millions of dollars. The Tweed Ring was so brazen that it invited its own downfall. The political cartoonist Thomas Nast, whose work appeared regularly in Harper's Weekly, launched a crusade against Tweed and The Ring. And when the New York Times obtained records showing the extent of financial chicanery in city accounts, Tweed was doomed. Tweed was eventually prosecuted and died in prison. But the Tammany organization continued, and its political influence endured under the leadership of new Grand Sachems. The leader of Tammany in the late 19th century was Richard Croker, who, as a low-level Tammany worker on election day in 1874, became involved in a notorious criminal case. A street fight broke out near a polling place and a man named McKenna was shot and killed. Croker was charged with the "Election Day Murder." Yet all who knew him said that Croker, who was a former boxer, would never use a pistol as he relied solely on his fists. At a celebrated trial, Croker was acquitted of McKenna’s murder. And Croker went on to rise in the Tammany hierarchy, eventually becoming Grand Sachem. In the 1890s, Croker exerted enormous influence over the government of New York City, though he held no government post himself. Perhaps mindful of Tweed’s fate, Croker eventually retired and returned to his native Ireland, where he bought an estate and raised racehorses. He died a free and very wealthy man. Tammany Hall was the archetype of the political machines that flourished in many American cities in the late 1800s and early 1900s. The influence of Tammany did not wane until the 1930s, and the organization itself did not cease to exist until the 1960s. There's no doubt that Tammany Hall played a major role in the history of New York City. And it has been pointed out that even characters like "Boss" Tweed were in some ways very helpful to the development of the city. The organization of Tammany, controversial and corrupt as it was, did at least bring order to the rapidly growing metropolis.